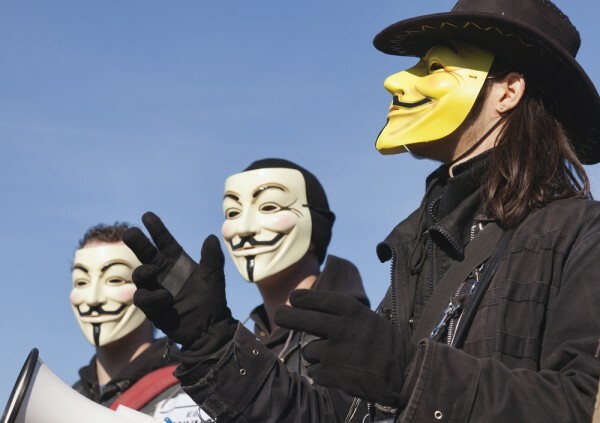 In what Anonymous called a "state-sponsored Denial of Service attack" on Demonoid, the group plans to make everyone aware they will not tolerate the takedown. In a statement, Anonymous accused the Ukrainian government of a form of international appeasement to the United States. This is not the first time this accusation has been hurled at a country's governing body. Spain, for example, fast-tracked the Sinde Law, its version of the Stop Online Piracy Act (SOPA), before talks with the USA. Documents posted to Wikileaks seemed to suggest the USA was actually strong-arming Spain into passing the act. News of the Ukrainian Government's involvement in the raid on Demonoid first hit the Web after an article ran in the Ukranian newspaper Kommersant on Monday. The paper reported that the raid on Demonoid was timed to coincide with the very first United States political trip for Ukrainian Deputy Prime Minister Valery Khoroshkovsky. Sources from the Ukrainian government reported that copyright infringement was going to be on top of the agenda. The US Government had previously stated it saw Demonoid as one of the most visited sites used to share pirated content. Demonoid.me is ranked globally as the 950th most popular site on the Web, and ranked 441st in the USA according to Alexa.com. But commonly Demonoid was also ranked one of the top 10 favorites of peer to peer BitTorrent mega-trackers. Starting around April 26, 2010, the site started to receive a series of Distributed Denial of Service (DDoS) attacks. The first round of which ended after Demonoid temporarily banned Taiwanese and Chinese IP address ranges. But DDoS attacks started again on July 24th, ultimately bringing down the site. On August 1st, Demonoid's admin changed the domain redirector straight to a reported malware distributing ad network for unknown reasons. The admin said that he was in the process of bringing the site back up. But on August 6, 2012, Ukrainian authorities shut down the site manually from Ukraine's largest data center ColoCall. So what kind of reprisal has the Ukrainian Government seen since Anonymous announced #OpDemonoid? The Kiev Post reported that DDoS attacks have shut down the websites of: the Ukrainian Anti-Piracy Association; the Ukrainian equivalent of the MPAA/RIAA (APO), the Ukrainian Agency for Copyright and Related Rights [uacrr.kiev.ua] and The National Television and Radio Broadcasting Council of Ukraine [nrada.gov.ua]. 1.Restore Demonoid services by any means necessary and, if possible, facilitate a series of mirror sites operated by free Anons everywhere. In essence, open source Demonoid. 2. Retaliate against those responsible for the interruption. And Lulz. The action was spearheaded by the usual cabal of lobbyists, SOPA/ACTA supporters, and their bribed politicians. Some artists and musicians who create the content shared via torrents have recently come out in favor of file-sharing culture and torrent tracker sites. Reports of artists using bit torrent trackers like Demonoid and The Pirate Bay become increasingly common, especially in the wake of reports that copyright infringement court settlements have ended up in the hands of the RIAA and MPAA, and not the actual artists whose content was being shared.